As promised in the previous post, here comes the second installment of styling the options menu. In the previous post we saw how we could change the background color of the options menu. This time we are going to look at how we could change the text color of Android options menu. We already know that styling the options menu is not really easy. As shown in the previous post, its a eight step process. To change the text color of the options menu we need to put in another hack. We need to add a ninth step. Lets look at all nine steps once again. Change the text color using reflection. This is the new step. We need to change the text color using reflection. The menu_selector.xml and colors.xml have been kept unchanged from the previous post. The comments are embedded in the code. One new methods has been added setTextColor. This method does the job for us! The above screenshot shows the menu item color changes when its pressed. That's it! 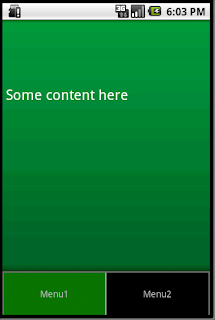 We have successfully changed the background color and text color of Android options menu. Entire code is here. Please follow the tutorial and you should get the desired results. Can this be achieved by any XML or anr .jar in \framework\ ??? This is exactly what I was looking for. Much appreciated. Just one question. I want to modify your code in order to override Activity class so I can automate font settings for all views with ability to set font. My idea is instantiate manually all controls and then check by reflection if they have the appropiate methods. The problem is that I receive (for example) as name "TextView", not the fully qualified name, which I need in order to instantiate the object. Do you have any clue on how to get the FQN of the class to instantiate in the onCreateView method?